An ultra-nationalist Serbian leader is poised for release from custody in The Hague until the start of his trial for war crimes. 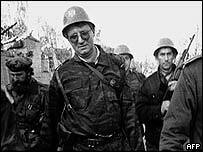 Serbia's government offered guarantees to the UN war crimes tribunal allowing them to free Vojislav Seselj along with former Gen Dragomir Milosevic. Both men, former allies of ex-Yugoslav President Slobodan Milosevic, face war crimes charges in The Hague. According to a 2002 law, suspects have the right to be freed pending trial. "We decided to give guarantees because we think that people should be released pending trial," the president of Serbia-Montenegro, Svetozar Marovic, told Serbian television. 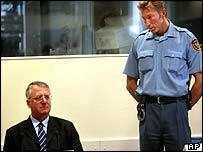 Mr Seselj surrendered to the UN War Crimes Tribunal in February 2003 and has been held in custody awaiting trial ever since. He is accused by prosecutors of forming a paramilitary group responsible for a series of alleged atrocities in Croatia, Bosnia and the Vojvodina region of Serbia, and fanning the flames of war with nationalist speeches. In past appearances at the tribunal he has denied ever torturing anyone, and questioned the legitimacy of the court to try him. Gen Milosevic, who is not related to Slobodan Milosevic, surrendered to Serbian authorities earlier this month and was transferred to the court's custody.